I met Leanne Powell at an old, beat-up prison, on a sweltering North Carolina summer day in 2016. We toured the worn facility, which dates to the late 1920s and housed prisoners until 2011, when, holding fewer than 200 inmates, it closed for good. Faded paint and cracked veneer. High weeds and unkempt yards, littered with stray blank rounds, the remnants of Army training exercises. Dank and dismal. And, on this day, almost unbearably hot. Powell, CEO of Southern Grace Distilleries in Mount Pleasant, couldn’t have seemed happier. She didn’t stop smiling as she pointed out the many buildings and her plans for them. Stills here, cookers there. Stacks of oak barrels, filled with aging bourbon, here and there. It was honestly hard to imagine. The distillery had been housed in a 2,200-square-foot space, part of a historic textile mill in nearby Concord. The former Cabarrus County Correctional Center —which includes 19 structures comprising 36,332 square feet, according to a posting by the state — encompasses 22.5 acres. “We thought it was perfect,” Powell told me. That’s maybe a bit hyperbolic. But just a bit. Southern Grace makes Sun Dog 130, an uncut North Carolina corn whiskey; Zero Dark 130, a white whiskey that comes in at 100 proof; and a couple of crazy good sweet spirits — Sun Dog Pink Lemonade and Sun Dog Apple Dumplin’. Southern Grace donates part of its profits to local animal shelters and other charities. Soon after settling into the old prison, now neat, tidy and welcoming, Southern Grace began distilling and barreling its bourbon, composed of 88 percent corn and 12 percent barley. As Powell envisioned, the distillers filled and stacked the new oak barrels — more than 200 of them — to rest and mature as a steady wave of heavy metal and rock music blared in the background. 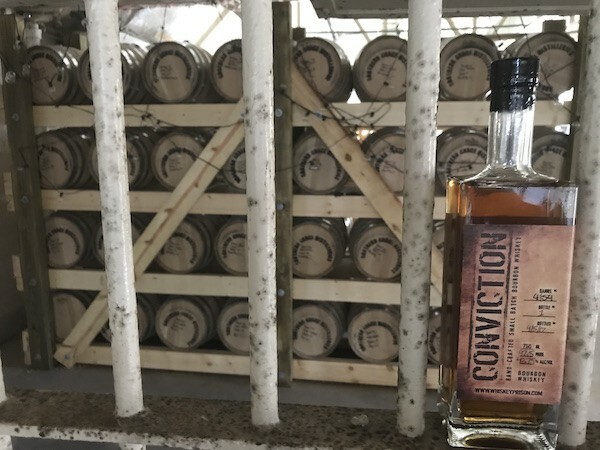 It’s the first bourbon aged — legally — behind bars, Powell says. Southern Grace will officially release the very-small-batch-cask-strength bourbon, which it calls Conviction, at 5 p.m. on Nov. 2. Powell offered me a sample from one of the first bottlings, which came in at 102.5 proof, and I will be eternally grateful. The whiskey was in the barrel for eight months, so it can’t be called “straight” bourbon, yet it’s remarkably smooth and complex. The nose reveals ripe cherries and a comforting hint of cinnamon, bringing to mind warm apples covered in brown sugar. A sip offers hints of honey and just a touch of oak. The barley brings a soft sweetness, much like an Irish whisky, especially after adding a drop of water. Soft vanilla and bright orange linger on the palate. Southern Grace has more than 2,000 gallons of Conviction resting in 53-gallon barrels destined Powell says, to become straight bourbon. This is already a fine whiskey, and more time in the clink will only make it better. Southern Grace, about 20 minutes northeast of Charlotte, encourages tours — which begin in the charming “prison” chapel — and regularly schedules weekend events, including music and food trucks. Check out the “after-dark” tours. Southern Grace spirits are available in North and South Carolina and Washington, D.C. Check the website to schedule tours or to learn how to order online.